It’s only been up for eight months now, so I figured I should probably share Chloe’s Barn Door…. Better late than never right?! Well, here is the back story. After moving our daughter into our old Dining Room, we obviously needed some doors for privacy. Luckily, a few of the original doors were left in the attic. Here is the tricky part…. with the layout of this room, a traditional door swing would not work… plus we would have had to take out the door frame & add a traditional casing in, which would leave a headache for the next owners as they would probably want the space open. So my husband tossed out the idea of a pocket door, that’s when I thought Barn Door! After searching for hardware online & seeing the major price tags that came with them ($300-$400), we were going to go the full DIY route, but as we walked the aisles of Home Depot sourcing all of the parts we would need we saw this kit. Ummm… $149, yes please! While we could have saved a little more completely creating this on our own, we decided our time & sanity was worth the extra money we spent! We honestly don’t DIY just to DIY around here. Believe it or not. Not wanting to go the Rustic Barn Door look, or uber contemporary as it just doesn’t fit the look of our home, we used one of the solid wood two panel doors to match the rest in the house. Surprisingly, this is not a look you see that often. Our existing door hardware throughout the house is black, so the Black Barn Door hardware coordinated perfectly & doesn’t feel out of place at all. It glides super smooth & C loves having this feature in her space. Not only do I absolutely LOVE the doors, but I also love the way you displayed the cord to the ampersand! I never noticed that before! So brilliant. What a smart solution. Well done! I love the door and you totally solved the cord-issue I have wondered how to deal with on your ampersand. Genius!! Great post! So neat to know that there is an affordable kit out there. Thanks for sharing this kit! My husband and I want to do the same thing with our laundry room doors. We've put this project off, even though it would really help make our hallway more functional. Now that I realize it's just a $149 kit, we may tackle it sooner! Is the black handle hardware original to your house? Part of the kit? Something different all together? Thank you so much! It looks great! 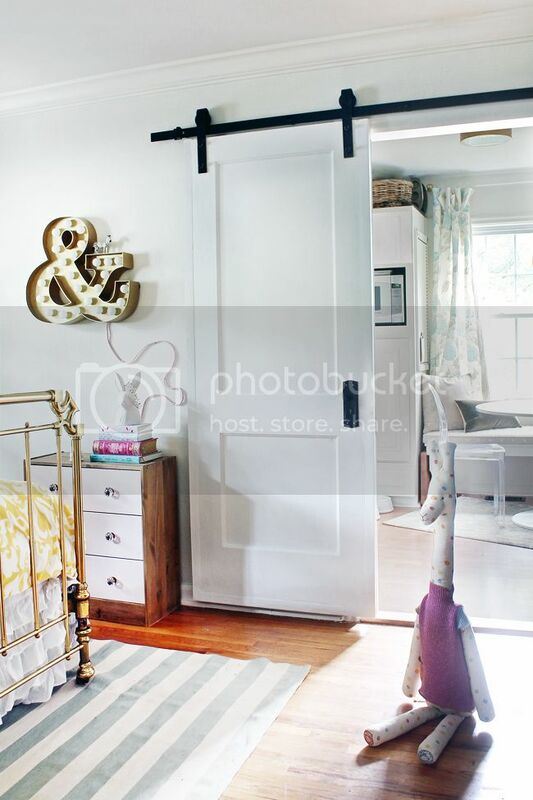 Love the modern barn door look. LOVE barn doors. This looks great, Kristin! Oh! In the UK a barn door is one where you can open the top or bottom half independently of the other if you wish. Like barns where horses can hang their heads over the bottom half of the door. We call these ones you've got "sliding doors"….. Do US barn doors – like farm ones – slide then?! Love this and that great Home Depot find might help convince my husband that it will work! One question, where are the light switches in your room? Does the door cover it/them when it's open like in the photo? Omg I had no idea Home Depot had the kits! This changes everything. We have the same situation in our new house. Our bedroom is off the dining room so we need privacy stat! Plus since the dining room is teensy the sliding door is a space saving superstar. Love this. So glad you went with the original door as well. Looks amazing. I've always wondered what the other side of a barn door looks like…is it easy to open and close from the kitchen side? Is there a handle or door knob on the other side? And if so, does it hit the trim of the door? It definitely looks great from this side!! It looks so beautiful! Your daughter must love her new bedroom! 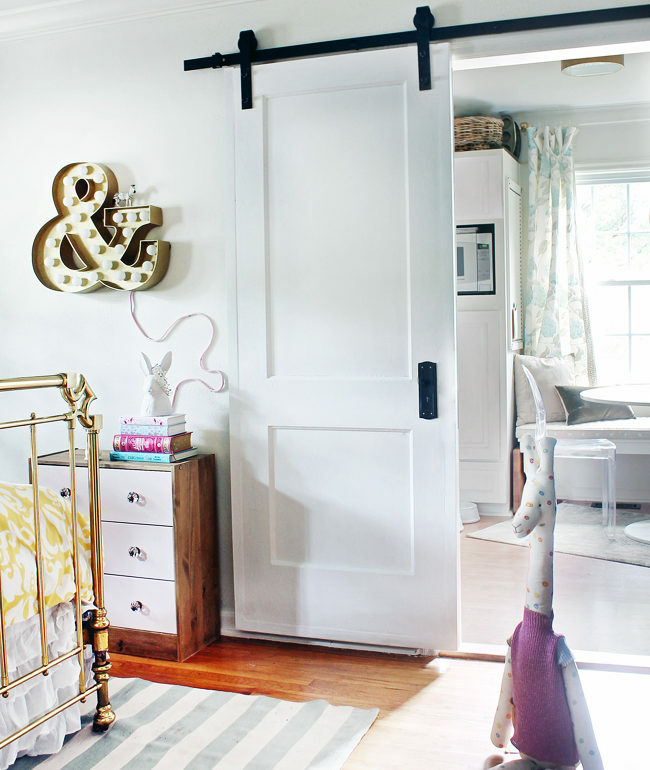 I love barn doors and traditional pocket doors…some day!! I too want to use this as a solution for our small bathroom off a hallway. But, since it already has a traditional door that swings in, would I have to remove the door casing and jam as well? I love this idea! Fantastic! Glad to know that Home Depot has a kit. where did you get your 2 panel door. it's so clean and contemporary. They are original to our 1960's home. The light switch is not by this door, so it was not a problem. The door looks just like this, minus the knob. We have the same black backplate & left the space where the knob would go open as a finger pull. It is really easy to open from either side.